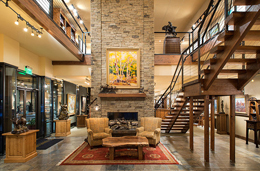 Trailside Galleries is headquarters for the offices of its' auction department, the Jackson Hole Art Auction. Since 2007, the Jackson Hole Art Auction has been recognized as one of the premier art events in the country, defined by the high standard of works offered in a variety of genres including wildlife, sporting, figurative, landscape and Western art by both renowned past masters and contemporary artists. The auction principals, Trailside Galleries and Gerald Peters Gallery of Santa Fe, NM bring over 100 years of combined experience and expertise to the event. The JHAA is a signature event of Jackson Hole’s annual Fall Arts Festival in September and attracts collectors from across the country as well as abroad. The thirteenth annual Jackson Hole Art Auction is scheduled for September 13 & 14, 2019. Since 1963, Trailside Galleries has been regarded as one of the pre-eminent dealers in American representational art, specializing in a rich and varied collection of works by the leading western, wildlife, figurative, impressionist, and landscape artists in the country. The artist roster includes award-winning members of the Cowboy Artists of America, The National Academy of Design, the Society of Animal Artists, Plein-Air Painters of America, the National Sculpture Society, and Oil Painters of America among other noted organizations. The gallery continually endeavors to expand and refine its diverse collection, bringing in new, dynamic talent that compliments the gallery’s existing roster of established artists. Our staff of art consultants, known for their experience and professional, friendly manner take genuine interest in assisting clients with all facets of the art collecting process including appraisal services, advice on restoration and conservation, insurance, installation, lighting, cataloguing and many other related matters that will assist collectors in building and maintaining their fine art collections. The Jackson, Wyoming location is a spacious two story building, offering over 10,000 square feet of display area showcasing paintings, sculpture and unique western furniture. Located just off the town square, the gallery is close to lodging facilities, restaurants and the abundant wildlife and spectacular scenery of Grand Teton National Park and Yellowstone. The gallery is also home to the offices of its auction department, the Jackson Hole Art Auction Since 2007, the Jackson Hole Art Auction has been recognized as one of the premier art events in the country, defined by the high standard of works offered in a variety of genres including wildlife, sporting, figurative, landscape and Western art by both renowned past masters and contemporary artists. The auction principals, Trailside Galleries and Gerald Peters Gallery of Santa Fe, NM bring over 100 years of combined experience and expertise to the event. The JHAA is a signature event of Jackson Hole’s annual Fall Arts Festival in September and attracts collectors from across the country as well as abroad.